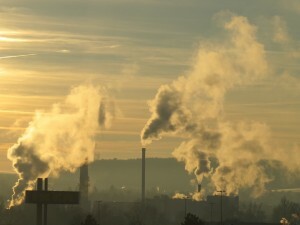 Air pollution is a hot topic in the media. Here is what you need to know about the causes of air pollution and how it affects the health of adults and children. Each of these can cause breathing problems and can increase asthma symptoms. Children, the elderly, and people with asthma are the most likely to be harmed by air pollutants. Ozone is commonly known as the layer of gas that protects the Earth from UV rays. However, only ozone in the atmosphere has this protective effect. Ozone located on the ground level is a health hazard. Ground level ozone is the result of industrial plants, electric utilities, motor vehicle exhaust, gasoline vapors, and chemical solvents. Each of these causes the release of invisible molecules that react with each other and create ozone on the ground level when it is warm and sunny outside. Inhaling ozone can cause chest pain, coughing, throat irritation, and congestion. If someone has bronchitis, emphysema, or asthma, ground level ozone makes it even more difficult to breathe. Eventually, repeated exposure to ground level ozone can scar the lungs. Particulate matter is made up of very small particles and liquid droplets. They can be acids, organic chemicals, metals, soil, or dust particles. Particulate matter forms when gasses from power plants, industries, and/or automobiles react in the air. This form of air pollution is found near roads, in smoke, in haze, and in forest fires. When these particles are 10 micrometers or less in diameter, they are small enough to go through the nose or throat, resulting in major health problems. When inhaled, particulate matter can cause serious lung damage, since the particles are small enough to go deep into the lungs. Particulate matter can cause premature death in people with heart or lung disease. Particulate matter has also been linked to nonfatal heart attacks, irregular heartbeat, and difficulty breathing. While individuals who already have health problems are more likely to be harmed by particulate matter, healthy people can be injured by these small particles as well. Carbon Monoxide is a gas that you cannot see or smell. It is released into the air by motor vehicles, so it is more likely in cities where there are many motor vehicles. Carbon Monoxide is harmful when inhaled because it results in blood not being able to carry as much oxygen. Since we need oxygen to live, carbon monoxide pollution can be harmful to anyone, but it is most harmful for people with already low oxygen levels. Nitrogen oxides are another type of air pollutant, also from emissions from cars, trucks, buses, power plants, and off-road equipment. Nitrogen oxide can cause inflammation of the airways in healthy people, breathing problems in people who have asthma or other lung problems, and worsen existing heart disease. Anyone who lives within 300 feet of a major highway, railroad, or airport, will be exposed to higher levels of Nitrogen Oxides. Unfortunately, that includes about 16% of housing in the United States. Sulfur Dioxides are gases created from the burning of fossil fuels at power plants and industrial facilities. They also result from burning fuels containing high levels of sulfur, by locomotives, large ships, non-road equipment, and other industrial processes. They cause breathing problems and increase other asthma symptoms. Lead is also considered to be a type of air pollutant. Lead used to be released into the air from gasoline, but while laws currently prevent lead from being in gasoline, lead from past pollution is still commonly found in dirt, especially in urban areas. Lead is especially dangerous for children, and can cause behavioral problems, lower IQ, and learning problems. In adults, lead exposure is linked to high blood pressure and heart disease. Often, smog is mentioned as a sign of air pollution. While it is an obvious sign of air pollution, most smog is invisible to the human eye. In 2015, researchers used mathematical models to find out how many deaths were caused by air pollution in 2010. They concluded that particulate matter air pollution caused adults to die earlier from chronic obstructive pulmonary disease (COPD), heart disease, and lung cancer, and for infants to die from acute lower respiratory illnesses (such as pneumonia, bronchitis, or flu). They estimated that 3.3 million deaths in 2010 were a result of particulate matter air pollution. If nothing is done to reduce particulate matter air pollution, the authors anticipated that in 2050 6.6 million people will die earlier as a result of air pollution. The authors found that “residential and commercial energy use” contributed most to the amount of deaths worldwide from particulate matter air pollution in 2010. However, the major contributors to particulate matter air pollution in the United States are emissions from vehicles and power generation. This is the first study to calculate the number of deaths caused by a type of air pollution. A different study published in late 2015 concluded that airborne coal particles result in more fatal heart attacks than other particles in the air. Air pollution will continue to harm adults and children unless drastic changes are made. While some air pollution is visible to the human eye, most cannot be seen. You can use a website or an app to monitor air quality, in order to reduce your exposure to all types of air pollution. Below are some websites and apps for monitoring air quality. On days when the air quality index is bad, it is best to avoid the risks and stay indoors. While pollution is risky for everyone, children, elderly, and people with heart or lung problems need to be especially careful. If you would like to learn more about how you can reduce air pollution, click here. 16. Di, Q., Dai, L., Wang, Y., et al. (2017). Association of Short-Term Exposure to Air Pollution with Mortality in Older Adults. JAMA. 318(24): 2446-2456. Retrieved from https://jamanetwork.com/journals/jama/article-abstract/2667069?redirect=true. Accessed on January 5, 2018. 17. Ridley, D., Heald, C., Ridley, K., and Kroll, J. (2017). Causes and Consequences of Decreasing Atmospheric Organic Aerosol in the United States. PNAS. doi.org/10.1073/pnas.1700387115. Retrieved from http://www.pnas.org/content/early/2017/12/18/1700387115. Accessed on January 5, 2018.